Okay, cards on the table, there was a lot riding on this review. I am a huge Alfa fan – some years back I had a 156, and if I’m honest it was a pig. It went wrong on a weekly basis… and that’s not an exaggeration. But if I’m really honest, I loved it anyway. When it was going, it was amazing – it felt connected in a way that other cars I’d owned just weren’t. And that’s the thing about Alfa’s of old; they were ever so slightly flawed, but they were such an amazing drive that you didn’t mind. My wife had a 147 at the same time and it had a set of quirks all of its own – but again we loved it and were very sad to see it go. So fast forward to today, and Alfa has gone through a bit of a transformation. On paper, I was worried then, that this new-age Alfa wouldn’t live up to my memory. The old trim levels for Alfa’s were Lusso, Turismo and Veloce. Now, they are Progression, Distinctive and Exclusive… plus a few specials, but the feeling of style and flair has seemingly gone. The model I tested was a Business Edition – this is not a name that would have been given to an Alfa 10 years ago. So has Alfa lost its touch? Has it ‘gone corporate’ and ‘conformed’? Yes, the trim level names seem to have lost their flair, but the car itself? Not at all. There were one or two styling points that I didn’t quite like, but that was a personal preference, and not a reflection on the design in any way. It drove like an Alfa, it felt like an Alfa, and (to a certain extent) it behaved like an Alfa. I’m not saying it broke down – in fairness it didn’t miss a beat. And I drove it a lot. But there were some quirks. For the first three days the navigation / stereo kept beeping at me. I did get to the bottom of it, and it was down to the navigation system identifying potential speed camera sites. Of which it would seem there are a lot of. Other than that it was a pleasure to drive. The bleeping of the lock / unlock however was incredibly loud! The engine, a 1.6 diesel, could maybe have used a little more oomph, but it was good, and it felt responsive. There is a D-N-A switch, (Alfa’s method of selecting the driving mode – All-weather, Natural, and Dynamic), needless to say, I spent most (okay, all) of the time in Dynamic. And it really made a difference. Hold the revs steady in Natural, and flick the switch into Dynamic and you get more revs, a surge of acceleration and a definite kick back into the seat. I loved it. The gearbox was good – it revved well, and always responded when asked. And (I’m aware this sounds odd) the stainless steel gear knob itself was very tactile – it was huge… but felt good and matched the driving feel of the car. So it drives like an Alfa, it has enough quirks to be a proper Alfa, and the design is still cool – in short, it’s a true Alfa. But as Alfa have only just re-introduced a saloon to their line up, the Giulietta has had a big gap to fill for some time as the only 5 door option. 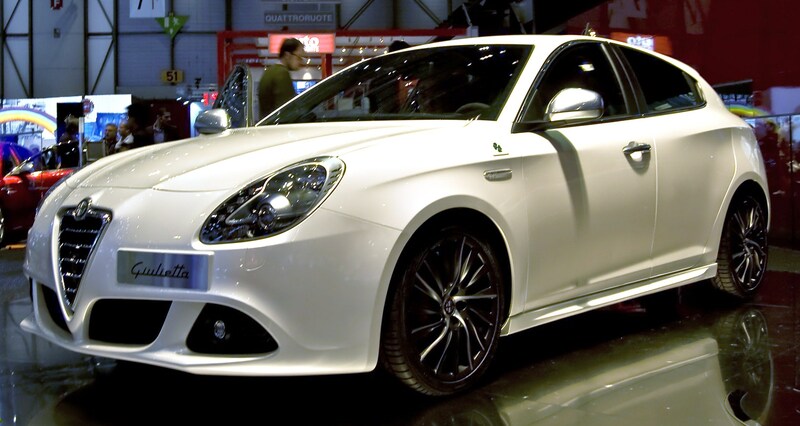 The Mito doesn’t have a 5 door option, and without a 4 door saloon the weight of the family and business executive has been borne on the Giulietta. It works too. I took a car load of four adult colleagues to a business meeting 20 miles away, and all were comfortable without any complaints (apart from one, who didn’t like the seat fabric). Family wise? Again, a win. It felt small and sporty, but with the kids in the back and the buggy in the boot there was still lots of space – to be fair the boot seemed more spacious than the Range Rover Evoque I tested back in the summer. So it’s stylish, drives like a dream, and can accommodate a team of business professionals or a family of four on a trip to Slimbridge on a wet weekend. I smiled every time I got in it, and was genuinely sad to see it go. So I’d say Alfa has managed to overcome the reliability issues that gave its cars their character, without losing the character. Would I buy one? Absolutely… but I’d probably go for the 2 litre diesel given the choice, but if I was given the 1.6, I’d be a happy driver. Very happy indeed.